Home / About Us / Blog / In the spotlight. TRIC mounting. TRIC mounting systems stay on the roof and stand up for what they promise. The use of high quality of aluminium and stainless steel create a strong system, designed to last. A cleverly arranged product family, the TRIC hallmark uses a few standardized components to quickly create optimized solutions for mounting on all roof types. For installers this means faster and easier installations. TRIC combines thought out components and clever details. 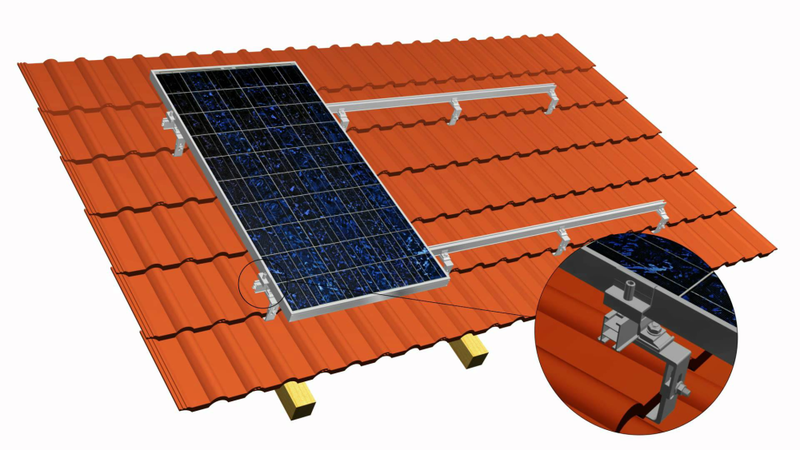 For example the Aluminium roof bracket with its triple adjustability, or the patented module fastener TRIC clip that allows for an even faster and still simpler module installation. TRIC’s interchangeable family of components work together to form a large range of solutions. On roof. Flat roof, Ground mounting. As the sole importer & distributor for the UK, Wagner Renewables Ltd have had the TRIC on roof mounting fully MCS 012 certified. 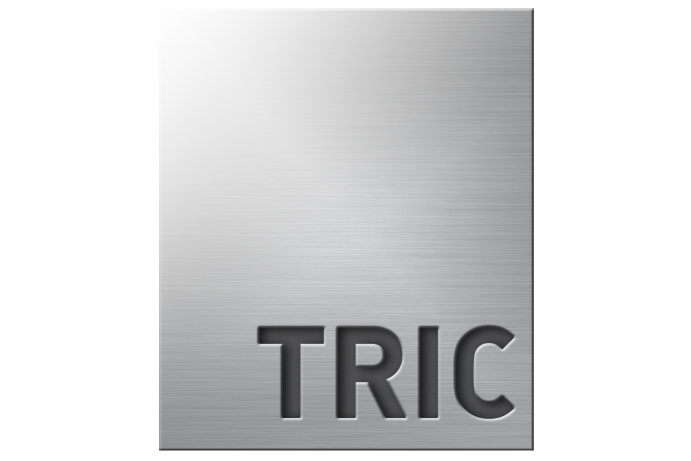 This is added to the long list of other certifications & awards the TRIC range has achieved, including TÜV certification. Our technical team are trained to design and specify the exact parts you need in order to complete an install. Using our design software TRIC Optimo, we can make sure you are getting the right parts needed, and a strong system with the correct loading calculations completed. We also work closely with our supplier Wagner Solar to collaborate on designs for large scale projects. With a large range of components we can often put together kits to suit your needs, simply talk to one of our technical engineers. TRIC A. On roof racking system. The TRIC A family of on roof mounting is a strong system. 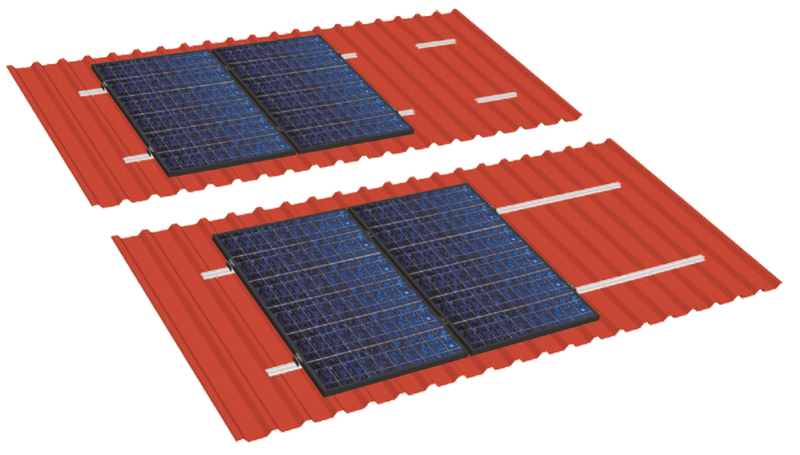 With various parts available there is a solution for almost any roof type. Traditional ‘P’ brackets form a solution for tiled roofs, P Alu HVN is a triple adjustable bracket great for roofs where adjustability is need to combat an uneven surface. The TRIC P Low is a low profile bracket perfect for pan tile or slate roofs, with the TRIC P Stv a similar version but with a higher profile, and extremely strong. These brackets all come pre-assembled for quick installation. BE Bolts are easy to install roof screws. With varying lengths available we supply versions for wood, or steel substructures. These combined with our BE Top connection set form the bracket needed to grab our rails. TRIC Rails; HDC, LDC, SDC. 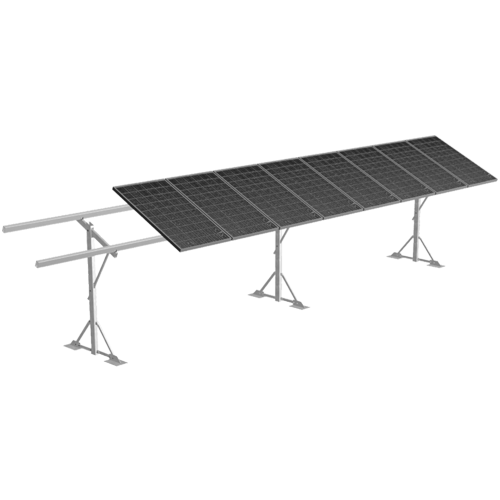 Aluminium extruded lengths of rail create an exceptionally strong base for the solar modules to be fixed to using the patented TRIC Clip. HDC and LDC rails are supplied in 3.3m lengths for easier handling and installation. Pre-assembled rail connectors, easily slide into the rail ends to form a solid join between lengths. TRIC TR Fix. Roof bracket system for metal roofs. 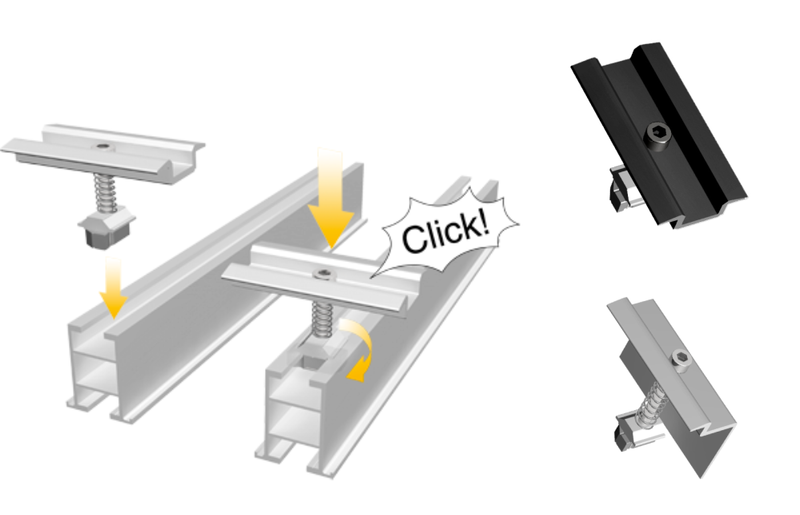 TR Fix is our solution for trapezoidal roofs, typically supplied in 395mm lengths the rails can be fastened to the roof using either rivets, or our quick to install super screw. The rails can be provided with short neoprene pads to ensure weather tightness, or pre-assembled with a full strip of neoprene. Longer continuous lengths of the TR Fix rail can also be supplied where needed. The TR Fix rails are fully compatible with our TRIC Clip. TRIC F. Free standing system for flat and sloping roofs. 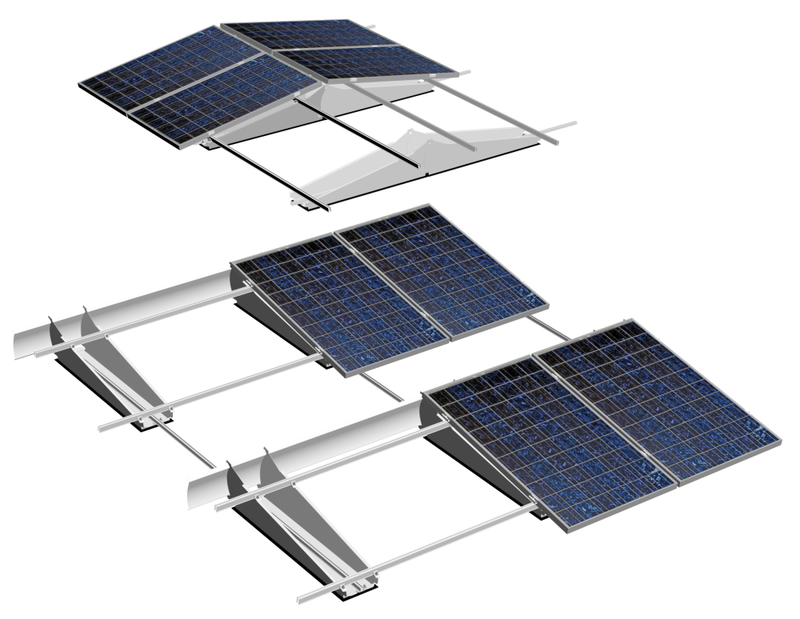 The TRIC F A frames provide a solution for flat roofs as well as sloping roofs. These come pre-assembled for easy installation. Two variants allows us to offer Portrait or Landscape mounting. Variable pitched A-frames allow you to adjust the degree of pitch during install to get the best angle to catch the sun! TRIC F 15°, 30°, 45°, these are installed along with our HDC mounting rail to form a strong racking system for solar modules in portrait. 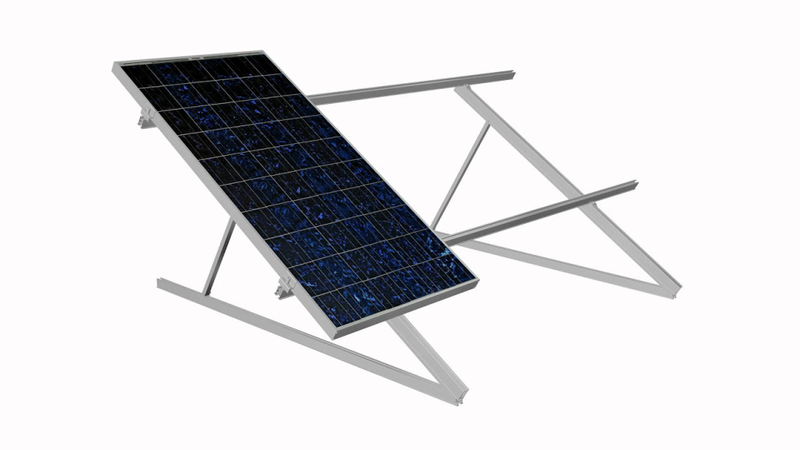 TRIC F Quer, this comes as a set of two A Frames which attach directly to the back of a solar module creating a landscape system. TRIC F Box. Mounting for common industrial flat roofs. Ballast mounting for flat roofs. Pre-formed trays allow for easy mounting across small or large areas of flat roof. A versatile system the TRIC F Box mounting can be installed in south (single) facing rows, with interconnecting rail an option for extra strength and stability where needed. Or installed as east / west rows maximising all available space. TRIC F Duo. Mounting for all conventional flat roofs. Our latest flat roof mounting. The TRIC F Duo is light weight and highly flexible. The system is designed to cut costs in three ways; low material cost, low transport cost, and ease of installation. One system can be installed as south facing in either 10°, or 18° with the other system designed for east / west mounting in 10°. Low ballast requirements allow the roof loading to be reduced compared to other systems. We have also developed a ballast tray designed specially for the Duo in order to easily hold in the ballast required. TRIC Clip. Simply ‘click’ into place. Pre-assembled with a clever spring mechanism, simply press into the rail channel and listen for the click. The TRIC Clip remains movable in the rail, and tightens using an allen key, as an added bonus the TRIC Clip is compatible with all of the TRIC rails, including our ground mounting systems. We hold a large stock of sizes to suit most modules currently on the market, all in aluminium and black variants. The components are structurally optimised and stringently tested. TÜV certified and MCS 012 approved. TRIC Flex One. Small to mid-sized ground mounting. Simply unfold and bury the pre-assembled steel roots to create a ground mounting system with a variable pitch for between 10° and 40°. MLC rail then spans between the Flex One steel uprights to form a strong racking for framed modules to be clipped into place with TRIC Clip. No concrete bases, or pile driving required! TRIC Flex Four. Mid to Large scale ground mounting. Premium grade aluminium and stainless steel greenfield mounting system that reduces your project costs on many levels: material, transportation and labour time. It is exceptionally versatile – even on difficult and uneven terrain up to 20°. Flex Four can be installed as either south facing or east / west tables, and with module pitches between 0° and 45°. Compared to comparable steel structure systems the Flex Four system is around 30% cheaper. All systems are ordered according to your bespoke design. If you would like to know more about the TRIC mounting range, or of you would like a quote, give one of our team a call, we can arrange training sessions on the mounting systems.